Approximately 10% of Americans suffer from post-traumatic stress at some point in their lives and 22 veterans take their own lives each day. I’d like to tell you about some very effective and safe treatments that can help a person suffering from this condition, including medical cannabis. While some people’s innate healing system can help them fully recover, mentally and physically, from traumatic events, other people experience a prolonged state of suffering. These residual symptoms and impairments are collectively called “Post-Traumatic Stress,” in medical terms, or PTS. 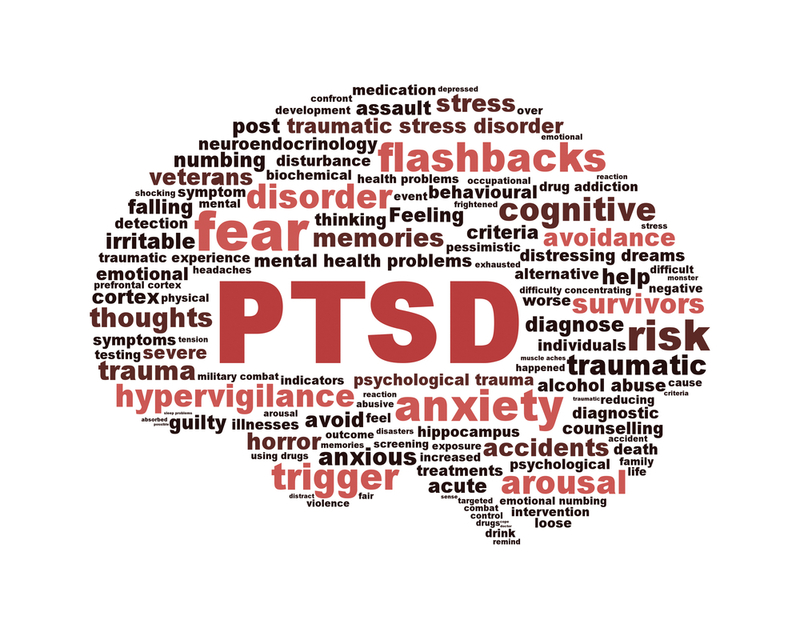 When these symptoms persist for longer than 1 month and result in decreased functioning in life, patients may be diagnosed with PTSD – post-traumatic stress disorder. Post-traumatic stress can show up in various ways in a person’s life. Some people re-experience the traumatic event, through flashbacks, nightmares, recurrence of physical pain, or persistent thinking about the event or its consequences. Some have so-called hyper-arousal symptoms, such as trouble sleeping, startling easily, difficulty concentrating, and trouble opening up emotionally. Some people avoid reminders of the trauma, and their lives become smaller and smaller. Some have trouble remembering or thinking clearly about the traumatic event, as if their subconscious minds are avoiding those traumatic thoughts, which truly need to be addressed and processed if the person is to heal. From an integrative, holistic perspective, there are many factors that predispose individuals to post-traumatic stress and many treatments that can relieve the suffering tremendously. I’d like to tell you about these treatments after a little background information about how your nervous system works. We all have an autonomic nervous system, which controls all the bodily functions you don’t have to think about, like breathing, circulation, digestion, and a lot more. The autonomic nervous system literally has two divisions; one promotes “fight or flight” physiology, while the other promotes “rest and digest” physiology. In the times of our ancestors, the fight or flight nervous system was very important for helping us avoid predators. Our digestion stops so blood can go to our muscles, our reactions become very abrupt and emotional so we don’t think too long before deciding to run away from the tiger, we become hyper-aware of our environment, which makes it hard to concentrate on one thing… you get the picture. The goal of PTSD treatment is two-fold. One on hand, we want to ease the patient’s symptoms, so they can continue to function in their lives and get some relief from the persistent suffering. On the other hand, we want to help people release that stored trauma, so their nervous system, and the rest of their body and mind, can return to a normal state of balance. That’s what I call healing. I have been incredibly impressed by the relief and healing we witness in our patients who use medical cannabis to treat post-traumatic stress. My twenty or so colleagues, in three medical clinics, agree, as do a number of recent research studies, which I’d like to briefly review with you. First of all, cannabis is excellent at reducing or removing the many symptoms of PTS. It works in a part of the brain that controls emotional memory, and literally helps patients experience life in the present moment. When under the influence of cannabis, patients with PTS can finally stop dwelling on the fearful memories. They are able to release their anxiety, smile, and pay attention to something beautiful that’s happening right now around them. The cannabis decreases the physical pain, prevents flashbacks and nightmares, and is an excellent treatment for insomnia. It frees patients from the great burden of their stored trauma. Over and over again, we hear patients say things like “this herb gave me my life back,” or, “I finally feel like myself again.” Patients can use cannabis and finally get some work done, enjoy their children, appreciate all they do have, and get back to their lives. Furthermore, medical cannabis can actually help heal the cause of the post-traumatic stress. What I’ve referred to as “releasing the stored trauma” is scientifically called “fear extinction.” A number of animal experiments have proven that compounds found in cannabis can promote fear extinction, helping the animals forget the painful stimuli they were exposed to, and return to their normal routines. Recently, two human studies have demonstrated the same findings.1,2 Both were placebo controlled; one used THC, the well known psychoactive component of cannabis, while the other used CBD, or cannabidiol, a cousin of THC found in certain cannabis strains, that does not cause any intoxication. These studies suggest that using cannabis in conjunction with therapies designed to release the stored trauma may enhance the benefits of those therapies. I also think of life as therapy, since we are always facing reminders of our limitations and having to choose between love and fear, acceptance or judgment, worry or trust. There are many effective therapies that are designed to facilitate fear extinction, and it is likely that cannabis users will have greater success with these treatments. While traditional psychotherapy may be helpful, I have found that certain approaches may provide faster and superior healing outcomes. I have been particularly impressed by EMDR (eye movement desensitization and reprocessing), EFT (emotional freedom technique or meridian tapping), hypnotherapy, DBT (dialectical behavioral therapy), and acupuncture. EFT is especially useful as it is simple and free to learn, powerfully effective, and can be self-administered at any time. Some patients suffering from post-traumatic stress are concerned that cannabis may be a dangerous treatment because it is addictive or because they have been told for so many years that marijuana kills brain cells and so forth. And I must admit that medical cannabis use does have some potential side effects. These effects, however, are often very mild, and with some fine-tuning of the treatment, can be avoided. Cannabis is approximately as addictive as caffeine for most people. And, most importantly, it is much safer than the conventional medications currently available for PTSD. Unlike those medications, cannabis has no lethal overdose, it is not associated with increased risk of suicide, and withdrawal symptoms of cannabis are mild and not-life threatening. Many people are concerned that if they use cannabis to treat post-traumatic stress, they’ll have to smoke it, or they’ll have to walk around stoned all the time. I am happy to tell you that this is certainly not the case. Many patients take cannabis orally and discretely in the form of tinctures or capsules. There are several strains of cannabis high in CBD, which convey the benefits of cannabis without getting people high and many PTSD patients are able to use an incredibly small amount of cannabis and still get excellent results. 1 Rabinak, Christine A., et al. “Cannabinoid facilitation of fear extinction memory recall in humans.” Neuropharmacology 64 (2013): 396-402. 2 Das, Ravi K., et al. “Cannabidiol enhances consolidation of explicit fear extinction in humans.” Psychopharmacology 226.4 (2013): 781-792.